The Sister Lucy Trust: We are going to do this in a scientific way. I have formed a educational trust that will dedicate itself to discovering the truth about Sister Lucy of Fatima, using all the most advanced scientific techniques available. 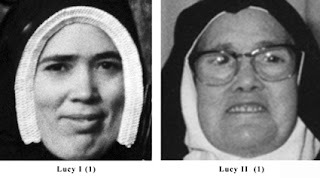 There is a firm that has already indicated its interest in pursuing the case and delivering a definitive answer to the question as to if the Sister Lucy Pre-1958 is the same "Sister Lucy" Post-1958. As I have stated, this is a non-religious professional organization that has no vested interest in the answer to the question at all. This project, to be done professionally, requires money. All donations to this organization will be tax-deductible. It will begin in earnest by the end of this year, 2017. I have two accountants and a tax lawyer working with me on it and am in contact with the investigative agency. I will let all of you in on the details once they are established and we will set up an easy way of donating to this incredibly worthwhile project. To what extent can you also investigate the circumstances of her changing religious orders? Do you know of any investigators in Portugal that could look into interviewing persons of interest in the two orders or obtaining documents? Focus on Sister Lucy's change of orders should be of primary concern as that is probably where the switch occurred. Anything involving death records, cemetery records, names of religious and their identities during that time would be a good start too. By all means, yes, please! I chanced upon the page (link below) before Tradition in Action saw and saved it. I think it has now been taken down. Please look at entry no. 265. A close examination of the dates above and below the entry concerning sister Lucia revealed that this document is a fake. All of the other deaths recorded on the page are from 2004 or 2005. Right in the middle of the page is the entry which is supposedly the true entry for sister Lucia in 1949. This "evidence" certainly does not add up. We don't need red herrings like this. The situation is complex enough as it is. I endorse this endeavor and have linked to it. Dr. Chojnowski, if you do set up a donation site please consider including a snail mail address for those of us who are leary about donating online but would be happy to send a check via mail. Outside of intensive (and bizarre) plastic surgery, a child can tell that they are two completely different people. It's a shame that people are so brainwashed that they can't believe their own eyes. A most worthwhile project. I will support it. It seems there was a chin implant. Might be significant. This is the link (above) to see before and after. If you raise the money you need for this inquest and the firm's report affirms that there was only one Sister Lucy, will you accept that answer? I don't have a dog in the fight, but if you can get pictures of the same ear, before and after 1958, that's almost as good as a fingerprint. professor, did you see Kevin Symonds' response to you? It is obviously a replacement. How much time will it take? I heard the 2 lucy theory from a cranky old franciscan during a sermon. I almost fell out of the pew.